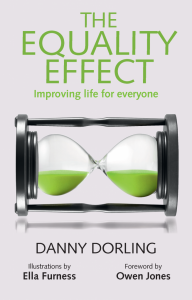 In The Equality Effect: Improving Life for Everyone, Danny Dorling delivers evidence that more equal countries enjoy better outcomes, with their populations being happier, healthier and more creative, producing less waste and committing fewer crimes. This optimistic book is a pleasure to read, writes Natasha Codiroli Mcmaster, and encourages us to see greater equality – and its social benefits – as being within our reach. If you are interested in this book, you may also like to watch a video or listen to a podcast of Danny Dorling’s recent LSE lecture, ‘The Equality Effect: Improving Life for Everyone’, recorded on 18 May 2017. In The Equality Effect: Improving Life for Everyone, Danny Dorling takes a renewed look at the growing evidence that has amassed on the stark and clear differences between equal and unequal societies in the ten years since Kate Pickett and Richard Wilkinson published the groundbreaking book, The Spirit Level: Why More Equal Societies Almost Always Do Better. Levels of equality within countries are associated with a startling range of outcomes. In more equal countries, people are happier, more numerate, produce less waste and commit fewer crimes. The list goes on, and with complimentary illustrations by Ella Furness, Dorling outlines the supporting data in a clear and engaging way. The book is optimistic about the future but does not shy away from a critique of policies and practices within unequal countries. The impacts of inequality are explored across three main areas, including impacts on children’s health, education and wellbeing; differences in environmental harm; and impacts on population and housing. Each chapter includes a number of scatter graphs measuring income equality within countries against one of the many outcomes explored. Whilst these charts are not fully convincing when taken alone, together the consistency of associations is difficult to ignore. In all cases presented, income equality is associated with positive social outcomes. One key example involves the skills of individuals within countries. Numeracy in young adults is highest in countries with smaller differences between the incomes of the top and bottom 10 per cent of people. In the US and UK – both relatively unequal but also relatively wealthy countries – maths ability is far lower than many more equal but poorer countries. In Japan and Scandinavian countries, which have a more equal income distribution, mathematics ability is relatively high. Numeracy skills, along with other forms of knowledge, are extremely important not only for day-to-day functions but also for individuals to have a greater understanding of the way the world works and to make better decisions in a democracy. On the societal level, the acquisition of skills allows the country to perform better economically, and allows for more innovation within sectors. Equality is also associated with environmental behaviour. In the Netherlands, over half of the population cycle or walk to work. In the US, where the income ratio is over double that of the Netherlands, less than ten per cent do. Meat, water and petrol consumption are also particularly high in the most unequal countries. The countries with the highest ecological footprints include the US and Singapore, both with an income ratio (between the top and bottom deciles) of over 15. Japan and New Zealand have the lowest ecological footprints and income ratios below 10. Key issues around data availability and its interpretation across countries are another important theme highlighted throughout the book. Many countries have different measures of the same underlying construct, and these can even change within countries over time. One clear example of this is the measurement of crime. There is a clear association between the levels of inequality within a country and crime rates. However, what is classified as a crime, or the number of people who report certain crimes, can vary widely across countries. For example, in Finland, income differentials are relatively low, but crime is extremely high compared to other countries. This could reflect more crime overall, but is likely to be at least partly explained by the fact in Finland all speeding offences are recorded as crimes. In many countries (including the UK) the majority of speeding offences are classed as ‘non-notifiable’, and not included in national statistics. 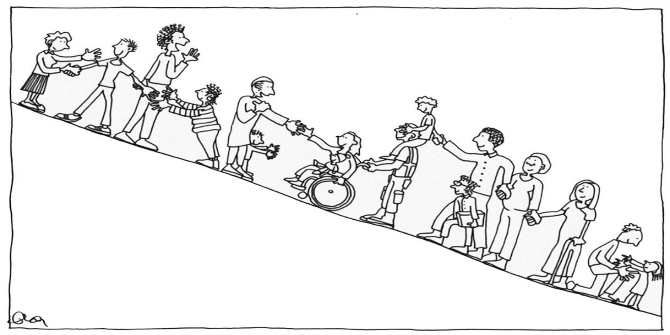 The Equality Effect offers an optimistic view of the future. Whilst stark inequalities are observed globally, overall the majority of countries are becoming more, rather than less, equal. It is difficult to see these shifts in part due to the negative bias in media reporting. The fact that we perceive inequality as being worse than before makes high pay differentials more likely to be reported, and thus to seem more likely overall. Therefore, when inequalities decrease, the focus of debate is not on this but on inequality itself. More equal societies also rarely leave much of a mark on history. Dorling points out that the pyramids in Egypt and many other great temples could only be made through the enslavement of others. The fact that this increase in equality is not occurring at the same rate across countries, as well as the high inequality in wealthy countries including the US and the UK, allows us to see the negative impacts of inequality most clearly. If we were all moving towards equality at the same speed, it would be more difficult to attribute subsequent positive outcomes to this, and easier to argue that the increasing wealth of the few would eventually trickle down to the many. Whilst previously popular, this latter argument has been notably absent from political discourse even in the relatively unequal UK. Dorling argues that this represents a change in thinking about inequality, which will ultimately lead to better societies. Dorling focuses on the changing rhetoric around basic income as an example of the fact that globally we are becoming more open to the idea of more equal societies, but also as an important next step in achieving equality. A basic income would allow everyone a base salary whether they are in work or not. Basic income is understandably argued to be unfair – why should some people get money for nothing whilst others work hard? In practice, however, no one gains if there are people living in poverty. The majority of people who do not work are unable to do so or are temporarily unemployed. A basic income would allow people to take up training, or to follow their passions rather than just take a job to survive. And with automation making many menial jobs redundant, the best way to harness human workforce in the future will likely be through greater creativity and innovation. A recent survey of public sentiment towards basic income across EU countries suggests that around 31 per cent people would be in favour of the introduction of basic income immediately, and a further 48 per cent would be in favour following successful trials. In the UK we have the groundwork for a basic income for those people who cannot work: however, this has been eroded in recent years through successive cuts to benefits. Basic income has recently been trialed in India with evidence of positive impacts on a range of outcomes including health, nutrition and labour market participation, and in Finland with some preliminary indication of positive impacts on mental health. There are further plans to runs trials in Canada, Kenya, Uganda, the Netherlands, the US and Scotland. I was left with some questions about the dynamics of different types of equality. The focus is on income inequality across all groups. Whilst issues of gender, racial and other types of inequality are touched upon, it would be interesting to compare levels of these types of inequality with levels of income equality overall. For example, are gender disparities always smaller in more equal countries? And if there are examples where this is not the case, why would this be? This may be a welcome focus of further academic study. The Equality Effect was a pleasure to read, and because the book covers research from such a broad range of disciplines, I would recommend it to anyone interested in in/equality or quantitative research more generally. The take home message of the book is that whilst it may take some time, greater equality is within our reach, and it is within our power to accelerate this process. This article was first published in the LSE Review of Books on 2 June, 2017 and is being republished with relevant permissions. The images has been sourced from the same article. About the author: Natasha Codiroli Mcmaster is a PhD student based at the Institute of Education, UCL. Her research focuses on inequalities in education, and her most recent research considered disparities in students’ subject choices. She has also worked as an analyst at the Department for Work and Pensions on projects aimed at understanding the drivers and consequences of disadvantage. This review gives the views of the author, and not the position of the LSE Review of Books blog, or of the London School of Economics.